A local authority has been persuaded to think again over its decision to award a contract to a national charity at the expense of a local disabled people’s organisation (DPO). Real has been providing direct payments support to disabled people in the London borough of Tower Hamlets for eight years, but was facing possible closure after losing out in a “competitive procurement exercise” to the national charity POhWER. Real accused POhWER of “unfair competition” by using its financial might – it has an annual turnover of nearly £10 million a year – to win the contract provisionally, with a bid of £199,000 for a contract the council had valued at £354,000 a year. Real put in its own bid of £353,000, and scored the highest of all seven bidders on “quality”, while its most recent survey of service-users found 100 per cent of those questioned agreed they had been given helpful information and support on how to manage direct payments. More than 40 banner-waving disabled people and their supporters lobbied councillors outside the council offices last week in protest at the decision to award the contract to POhWER. In a “very unusual” move, the council’s overview and scrutiny committee voted unanimously later that evening to ask the independent elected mayor of Tower Hamlets, Lutfur Rahman, to reconsider his decision to award the contract to POhWER. Rahman has now agreed to look again at the award of the contract. He said: “Following the decision of overview and scrutiny, I await a further report from officers which will take account of the concerns raised at the meeting. “I myself raised similar concerns as the petitioners when presented with the outcome of this procurement process. Mike Smith, chief executive of Real, said: “I can understand that the council could be tempted to make such a big saving, but this is a false economy. “The average annual price of the other seven bids was £326,500, so how can this one organisation deliver an equivalent service for only £199,206 without cutting corners? 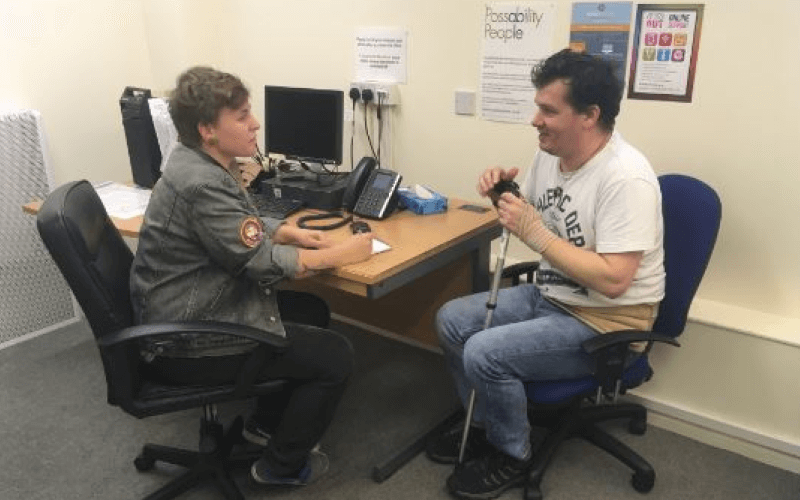 Real staff member Emma Preston-Dunlop said: “I can be truly myself working at Real; I’m disabled and LGBT and it’s simply a non-issue amongst my colleagues. The diversity of our team is our strength. “Clients appreciate working with support staff who know what it’s like to live with impairments and disabilities, they appreciate the community languages we speak and the flexible hours we offer. But POhWER’s chair has refused to pledge that his organisation would stop competing against local DPOs for contracts. But he refused to comment on Tower Hamlets because it was “still going through the process” of awarding the contract. Goss also admitted that only 45 per cent of POhWER’s trustees were disabled people, even though his chief executive, Damian Brady, claimed in an interview with DNS last month that all but one of the board members were disabled. Brady has now apologised for the error. All of Real’s board members are disabled people, as well as three-quarters of its client-facing staff. But Goss said: “I am disabled, I am a service-user and I really recognise the importance of local organisations. Brady said POhWER had three other direct payments support contracts, in Buckinghamshire, Sandwell and Shropshire, each one secured through a competitive tendering exercise. Brady said it had been “necessary to reduce our staffing levels after taking on the Sandwell contract as a result of the financial model ordained by the borough in the tender”. In some parts of the country, said Goss – such as in Richmond, south-west London – POhWER owns and runs an advocacy contract but works with local user-led organisations, which carry out “frontline delivery”, with POhWER providing support and “back office” functions. Goss said POhWER was now putting together a new “programme of initiatives to look at how we can support DPOs but also individual disabled people who may want to sit on boards, may want to become part of a DPO, or maybe set one up”. But Smith, former disability commissioner with the Equality and Human Rights Commission, said: “I think they are being more than a little disingenuous blaming commissioners for this outcome. “Based on information we obtained using a Freedom of Information Act request, POhWER bid £122,794 per year less than the average of the top five bids, and £139,832 per year less than they needed to in order to win overall. “So by bidding so extraordinarily low they left commissioners with little choice. I just can’t reconcile their statements to be supporting DPOs with a ‘positive, proactive approach’ with their actions.